Here is another unique and fascinating herbaceous perennial plant like the Adenium obesum (Desert Rose), that will develop an attractively swollen and knobby caudex as it ages. A tropical beauty with bright orange-red inflorescence towering above its dark green foliage in lovely contrast. We had grown this attractive-looking ornamental plant about 3.5 years ago, but no longer now. Just an image in our photo archives to remind us of its brief one and a half year’s existence in our tropical garden, marvelous while it lasted. Hmm…may consider growing it again?? Origin: Native to Central America, Guatemala to Panama. Naturalized worldwide in the tropics. 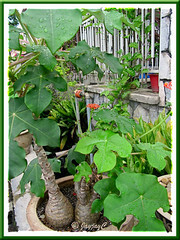 Features: Jatropha podagrica is one of the approximately 175 species of succulent plants of the genus, Jatropha. A popular ornamental plant that typically grows between 0.5-1 meter in height, taller when ground-planted in garden than being potted. Exotic, yet weird looking in a captivating way, with a stout and knobby stem that develops from a swollen gout-like, bottle-like or belly-like base or caudex, hence attributing to a few of the plant’s common names. The trunk is greyish in colour with bristled scars. Foliage is medium to dark green, sometimes slightly two-toned, with large peltate leaves, up to 30 cm across. They are orbicular with 3-5 distinct and deep lobes, bluntly tipped and held on long petioles that fans out from the top tip of the succulent stem, forming a luxuriant green crown. As showy as the fabulous foliage are its clusters of small and brightly coloured orange-red flowers on short pedicels. The inflorescence is cymose and coral-like in manner, held terminally on a long and slender peduncle that emerges from terminal stem as with the leaf petioles. 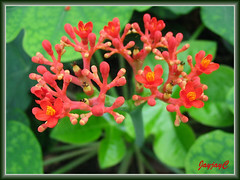 Jatropha podagrica flowers all year round in favourable environment, especially in the warmer months of the year. Roundish seed pods or fruits are set freely after flowering, start off a lovely fresh green and turn blackish brown when matured. When ripened, they burst open to scatter smooth and glossy brown seeds several meters away. Seeds will self-sow easily on suitable soil. Beware that all parts of Jatropha podagrica are poisonous, especially the seeds where one seed is sufficient to cause severe poisoning. Like all members of the Euphorbia family, when cut it exudes a white milky sap which may be a skin irritant to some people. Culture (Care): Jatropha podagrica or Buddha Belly Plant is a relatively fuss-free plant, easy to care for and flowers frequently year-round. Light: Best growth and blooming in full or filtered sun outdoors, and bright light indoors. Can tolerate light shade to partial shade. 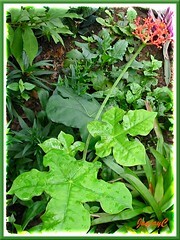 Leaves grow larger and are darker in colour, if planted in shady locations. Moisture: Moderate water regularly, especially during hot and dry seasons. Allow to dry out between waterings, overwatering can lead to root rot. Being a succulent, drought tolerance is high, but regular watering and sufficient sunshine will result in luxuriant foliage and frequent blooms. Soil: Grows best in fertile, well-drained sandy soil though tolerate any type of soils. Others: They are not heavy feeders. If necessary, feed once quarterly with a balanced liquid fertilizer. Be careful when handling the plant as it exude a milky latex when cut, that may cause skin irritation. Wear gloves if you’re prone to such sensitivity. Read somewhere that keeping its foliage pruned enlarges the trunk’s base. Also, if the swollen stem is slightly ‘injured’ or a section of its bark ‘scratched’, a new stalk will emerge at the spot. You may want to try that to keep the plant bushy. Relatively pest-free, though watch out for aphids and mealy bugs that may infest occasionally. For sub-tropical and temperate regions: Hardiness: USDA Zones 10-11. Gout Plant can only tolerate minimal frost. In winter or cooler clime, where plant may be deciduous, reduce water and no feeding until spring. 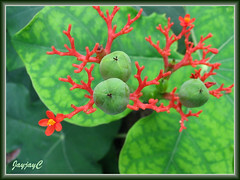 Learn more about Jatropha podagrica from the gardening community at Dave’s Garden. Propagation: Easily propagated from seeds. It self-sow easily too on soil. 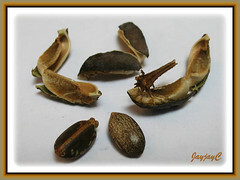 Its fruit or seedpod is highly dehiscent when ripened to blackish-brown in colour, exploding to scatter the seeds several meters away. Thus, best to bag the about-to-ripen seedpods with a plastic bag or a gauze cloth to capture and collect the seeds. 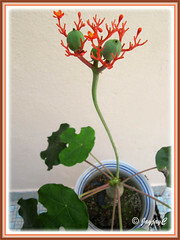 Usage: Jatropha podagrica or Goutystalk, a lovely and exotic specimen plant is excellent for container planting, outdoors or indoors as a houseplant. Even suited as a bedding or border plant in the garden and can be planted en masse or in mixed plantings, in sunny or shady location. It’s a butterfly and hummingbird attractant too. 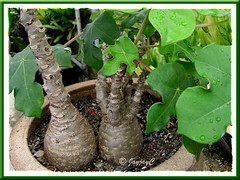 Quite dwarfish in stature if potted, it becomes a natural bonsai plant with its unique and attractive gouty trunk base. Truly ornamental! Besides, it has medicinal uses too. The roots have shown antimicrobial, antibacterial and antifungal activity as mentioned at Wiley InterScience. In China, it’s used for reduction of swelling, pain relief and to detoxify snakebites, while in Ghana and Nigeria, it is used as an antipyretic, diuretic, choleretic and purgative. In Mexico and southwestern United States, it is used to tan leather and produce a red dye. Wonder whether this species, Jatropha podagrica has the potential source of biofuel, like the other species, Jatropha curcas which is cultivated commercially in many regions worldwide for production of biofuels? Late September last year, we chanced upon a couple of seedlings by the roadside, brought it home and had them pot-planted. And, we were wonderfully surprised by the appearance of its first stalk of flowers early last month! Wow! More Gout Plant pictures here, if you’re interested. 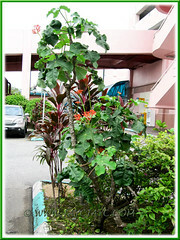 This Jatropha podagrica (Gout Plant) shrub really caught our eyes when we spotted it at the parking area, outside a shopping complex last December. We’ve never seen one that tall before and towering above the other plants in the crowd! We were amazed to discover that when grown on the ground the shrub can scale to about 2.6 m (8.5 ft) tall. Fantastic! Definitely delighted that I had brought along my camera and was able to snap a shot to share it here. A friend of mine had passed to me this plant seeds. Not ready yet to plant them. Do you have any tips in getting this plant growing from seeds? I purchased seeds for a Buddha Belly plant a year ago and planted them. It was my first time trying to grow anything from a seed, usually I would just purchase a plant from a gardening store. I used a small greenhouse-like container, kept the pots moist and not directly in the sunlight and the things sprouted immediately. But it’s been a year and the plants, though getting somewhat bigger, are still relatively small with the stem only about 5 to 6 inches tall. The stem is not thick at all and each plant has a couple small leaves. My question is how long does it take to grow into the plant that is pictured above? I don’t mind if it takes long, but I am wondering if I am doing something wrong. I water them about once a week and I place them a couple feet away from my window which gets a lot of sun. Any suggestions? Could I email you a picture of the plants? Sorry Sam, we’re unable to give you definite suggestions. 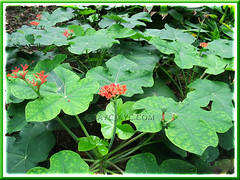 The image of Jatropha plants you referred to was captured at Rimba Ilmu Botanic Garden in Kuala Lumpur where the experts would know how best to care for them. However, I did notice that the plants were in a sun-filtered location in a forest environment, where humus is naturally in abundance and conducive for best growth. Our latest experience with planting a Jatropha seedling last September in a pot with ordinary potted medium had resulted in its first flowering last month. Have a look over here. We just cared for it as would any other plant, no special care or attention and it just surprised us recently. Fact is, I just went to have a look at our almost 5.5-month old plant to measure its stem and thickness for your comparison (height-4.5″ and thickness-1.7″), and noticed another flower stalk had just started to emerge. Sam, we’re just passionate gardeners, no special training and simply enjoying whatever nature can reward us, so we don’t have the right answers for you. Just hope that my sharing can provide some helpful clues. i have read from a blogger that Jthropaha is Poisonous. But here beside our house our neighboor she put the Roots in a jar with wine/rhum. is it dangerous? Or it has health benefits? Thanks! and i would like also to ask. just to be sure that if ver i will put a business in selling the plant is it safe? Thanks! Btw, this is the link where i read that its a poisonous plant. Thanks! Good day to you too, Vanessa! Sorry that we’re unable to answer your enquiries which is out of our league. Anyhow, thanks for the link you’ve provided.. it is very informative. Hi wilannette! Hope some site visitors living in the neck of your woods will be able to give you some advice. Anyway, all the very best for your plants survival! Just a note about the toxic properties of Jatropha podagrica. All parts of the plant contain a number of poisons and irritants. It is said that eating just a few of the seeds can be lethal to an adult human. Apparently, J. podagrica is used in folk medicine for several purposes, especially as emetic and purgative (i.e. to induce vomiting and diarrhea). However, I would not experiment with it– I prefer herbs that are less likely to kill me if I make a small mistake. Apparently, all of the Jatropha species are toxic at least to some degree. It is a relative of the Euphorbias, and as far as I know all Euphobia species are also poisonous, or at least irritating. Hi Gary C…. much thanks for sharing your insights. Indeed, I share your opinion i.e. better safe than experiment and regret. Hello. Though I would get some insight here. I’ve been having little luck. My Jatropha podagrica is oozing black where a leave had been snipped and it has run down the plant stem. Is this rot? if so what can i so about it. I attempted to slice off the infected area but hope that wa the right choice. I love this plant and fortunately I live in SW Florida. I had it for a few years in a pot and it did well but when I decided to put it in the ground, WOW. Our soil is basically sand and it reseeds it self easily and with no help from me. I do nothing for it and it survives the cool sometimes cold dry season here and has no problems with the hot wet summer as well. I’ve noticed when it has slight shade the trunk becomes much fatter. May you continue to enjoy your Gout Plant for many more years. And, may the 2017 New Year be a blessed, joyful, healthy and fulfilling one for you. I have a budda plant cutting…will it take if i put it in soil with root hormone? Yes, it’s possible to propagate from stem cuttings. Just dip it in rooting hormone, then pot into a small pot and locate it in a warm, bright area. All the very best to you.